The first stories to feature The characters in the Thomas the Tank Engine books were invented in 1943 to amuse his son Christopher during a bout of measles. After Awdry wrote The Three Railway Engines, he built Christopher a model of Edward, and some wagons and coaches, out of a broomstick and scraps of wood. Christopher also wanted a model of Gordon; however, as that was too difficult Awdry made a model of a little 0-6-0 tank engine. Awdry said: “The natural name was Thomas – Thomas the Tank Engine”. Then Christopher requested stories about Thomas and these duly followed and were published in the famous book Thomas the Tank Engine, released in 1946. The first book (The Three Railway Engines) was published in 1945, and by the time Awdry stopped writing in 1972, The Railway Series numbered 26 books. Christopher subsequently added further books to the series. 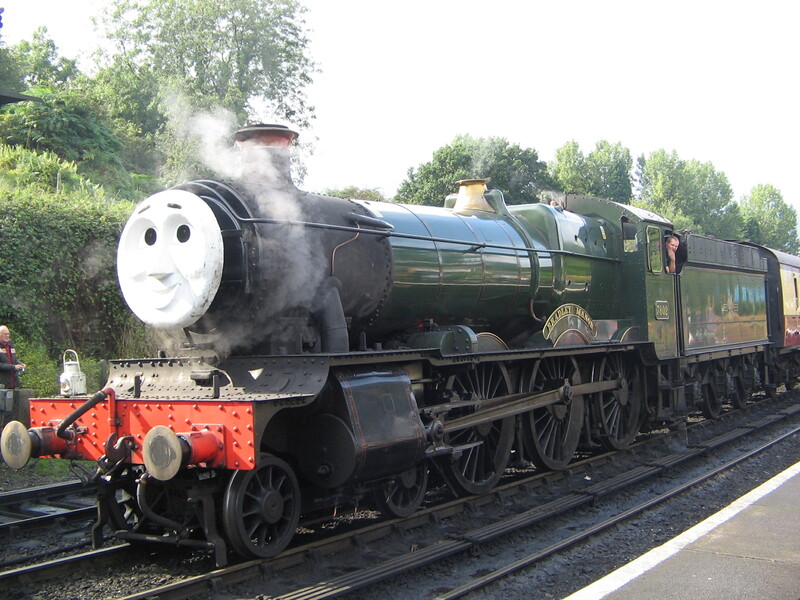 In 1952, Awdry volunteered as a guard on the Talyllyn Railway in Wales, then in its second year of preservation. The railway inspired Awdry to create the Skarloey Railway, based on the Talyllyn, with some of his exploits being written into the stories.Awdry’s enthusiasm for railways did not stop at his publications. He was involved in railway preservation, and built model railways, which he took to exhibitions around the country. Awdry wrote other books besides those of The Railway Series, both fiction and non-fiction. The story Belinda the Beetle was about a red car (it became a Volkswagen Beetle only in the illustrations to the paperback editions). Awdry was awarded an OBE in the 1996 New Year’s Honours List, but by that time his health had deteriorated and he was unable to travel to London.His ashes are interred at Gloucester Crematorium. Generally regarded as one of the greatest F1 drivers to have raced, the Brazilian driver & three-time Formula One world champion Ayrton Senna was born21st March 1960 in Santana near Sao Paulo. He began his motorsport career in karting, moving up to open-wheel racing in 1981, and winning the British Formula 3 championship in 1983. He made his Formula One debut with Toleman-Hart in 1984 before moving to Lotus-Renault the following year and winning six Grands Prix over the next three seasons. In 1988, he joined Frenchman Alain Prost at McLaren-Honda. Between them, they won all but one of the 16 Grands Prix that year and Senna his first World Championship. Prost claimed the championship in 1989, and Senna his second and third championships in 1990 and 1991. In 1992, the Williams-Renault combination began to dominate Formula One. Senna nonetheless managed to finish the 1993 season as runner-up, winning five races and negotiating a move to Williams in 1994. Senna was recognised for his qualifying speed over one lap and from 1989 until 2006 held the record for most pole positions. He was especially quick in wet conditions, as shown by his performances in the 1984 Monaco Grand Prix, the 1985 Portuguese Grand Prix, and the 1993 European Grand Prix. He also holds the record for most victories at the prestigious Monaco Grand Prix – six – and is the third most successful driver of all time in terms of race wins. Senna courted controversy throughout his career, particularly during his turbulent rivalry with Alain Prost. Both the 1989 Championship won by Prost and the 1990 Championship won by Senna were decided by collisions between them at those years’ Japanese Grands Prix. Sadly though Ayrton Senna was tragically killed on 1st May 1994 at the peak of his career in a crash at Tamburello corner while leading the 1994 San Marino Grand Prix at Imola. March 21st was proclaimed World Poetry Day by UNESCO (the United Nations Educational, Scientific and Cultural Organization) in 1999, in order to promote the reading, writing, publishing and teaching of poetry throughout the world and to “give fresh recognition and impetus to national, regional and international poetry movements” and support linguistic diversity through poetic expression and to also offer endangered languages the opportunity to be heard within their communities. Moreover, this Day is meant to support poetry, encourage a return to the oral tradition of poetry recitals, promote teaching poetry, restore a dialogue between poetry and the other arts such as theatre, dance, music, painting and so on, support small publishers and create an attractive image of poetry in the media so that the art of poetry will no longer be considered an outdated form of art but one which contributes to creative diversity. World Poetry Day is also an invitation to reflect on the power of language and the full development of each person’s creative abilities and to encourage the free flow of ideas by word, creativity and innovation by questioning anew our use of words and things, our modes of perception and understanding of the world. Through its associations, its metaphors and its own grammar, and to promot the idea that poetic language is another facet of the dialogue among cultures. The 8th anniversary of World Down Syndrome Day is celebrated on 21 March 2013 and has been officially observed by the United Nations since 2012. On this day, people with Down syndrome and those who live and work with them throughout the world organize and participate in activities and events to raise public awareness and create a single global voice for advocating for the rights, inclusion and well being of people with Down syndrome. Many of these events are recorded on the official World Down Syndrome Day website. However there is still so much more we can do.Down Syndrome International encourages people all over the World to choose themes, activities and events to help raise awareness of what Down syndrome is, what it means to have Down syndrome, and how people with Down syndrome play a vital role in our lives and communities. Down Syndrome International also announced that the World Down Syndrome Day Awards would be held every year on 21 March. Click HERE for more deails. The International Day for the Elimination of Racial Discrimination is observed annually on 21 March. To mark the occasion, on 21st March 1960, when police opened fire and killed 69 people who were at a peaceful demonstration against Apartheid in Sharpeville, South Africa. Proclaiming the day in 1966, the United Nations General Assembly called on the international community to redouble its efforts to eliminate all forms of racial discrimination, and In 1966 the United Nations declared the first Day for the Elimination of Racial Discrimination to commemorate the protesters who had been killed. This year, celebrations will be marked by two major events in the framework of the International Coalition of Cities against Racism, an initiative launched by UNESCO in March 2004 to establish a network of cities interested in sharing experiences in order to improve their policies to fight racism, discrimination, xenophobia and exclusion.